Bryophyta is a free-to-play Moss Giant boss found within her lair in the Varrok Sewers. A mossy key, acquired as a rare drop from regular moss giants (1/150 chance) is required to access her lair and is consumed on each use, meaning you can kill Bryophyta one time for every key you have. 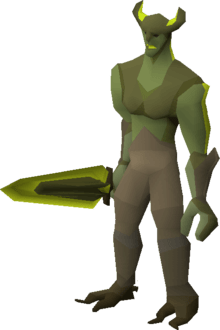 Free-to-play players looking to kill Bryophyta will also need some sort of blade in order to cut through the thick webs of the Varrok sewers. The Bryophyta fight is fairly simple, her main attack is magic based so you want to use the Protection from Magic prayer and any other offensive prayers you have available. During the fight, Bryophyta will spawn three Growthlings. While these Growthlings are alive, Bryophyta is immune to damage so you must kill all three before switching your attacks back to Bryophyta. To kill the Growthlings – you must attack them down to around 10% health and then use an axe or secateurs on them. If you don’t have an axe, there is one available to pickup from a pile of logs in Bryophyta’s lair.